Rick Pendergast is the owner of Soda Blasting NC . Born in North Tonawanda, New York, Rick moved to North Carolina in 1977. He has lived in Winston-Salem since 1980. He began contracting and painting houses in 1990. Through the years he added to his skills as an accomplished painter and excellent finish carpenter. He learned to build decks, set tile, hang doors, install windows, and do everything required to remodel homes. Business went well, and he developed a loyal customer base. In 2005, he started Different Strokes, his painting company. He founded Soda Blasting NC in the summer of 2009. Since forming Soda Blasting NC, he has moved both companies into a new 5,000-square foot building that he purchased for that purpose. He is in the process of upfitting the new facility by constructing a large 650-square foot drive in, enclosed blasting booth. Customers can bring any item large or small and leave it with confidence to be soda blasted in his new building that is protected by an electronic alarm system. Rick’s wife, Debbie, is in charge of administration for both companies. She helps with some of the physical work as well. She is also the client contact representative. 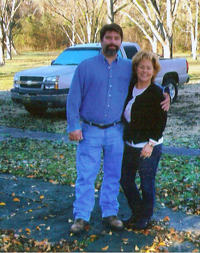 Rick says, “She has never met a stranger.” Rick and Debbie have been together since 1998. Jeff Morris has been a professional painter in Winston-Salem where he has lived for the past 25 years. He also has years of experience in most fields of construction. He has a fine reputation and is well liked and respected by everyone who knows him. He and Rick have worked together on and off since the early 1990s. Jeff went to work full time for Different Strokes in 2006. He now also works for Soda Blasting NC. Jeff still lives in Winston-Salem, now with his wife Lisa and their two daughters. Chris has been a friend of Rick’s since they were 12-years old. They have worked together on and off ever since Rick started a contracting business in the early 1990s. He now does work for both companies. Chris is married and has three children.